How Does a Team Differ From a Community of Practice? People, in general, know a lot about teams, whether they are sports teams or work teams. On a team, everyone works together to achieve a single goal. Within organizations, people often talk about teams that aren’t actually teams. For instance, our Human Resources team. In reality, you should talk about our Human Resources Community of Practice. So, what’s a community of practice and how is it different from a team? Cognitive anthropologist Jean Lave and educational theorist Etienne Wenger developed the term, a community of practice in their 1991 book, “Situated Learning.” A community of practice describes a group of people with similar concerns or passions and has three key elements. What does this mean for business? Well, first, you need to understand the difference between a team and a community of practice. A business team is best described in sports terms. In football, everyone has the same goal—to score. But on the team everyone has a different responsibility. A group of 11 quarterbacks would never accomplish anything. Nor would a group of 11 linebackers. When you have a team, you have people in different roles working towards a common goal. So, in business, you might have a group of people whose goal is to sell widgets and another group who has a goal of selling anvils. Each team has designers, manufacturers, marketers, procurement specialists, and salespeople. This bringing together of a variety of roles is what makes up a team. In Contrast, What Does a Community of Practice Look Like? Take a look at your widget team and your anvil team. Each of these teams has marketers, and each has salespeople. The widget salesperson and the anvil salesperson are part of a community of practice even though they are a part of separate teams. They may work closely together. They may swap ideas. They may participate in the same training sessions. While they have the same overarching goal of making money for the company, they aren’t on the same team. One employee sells widgets while the other sells anvils. 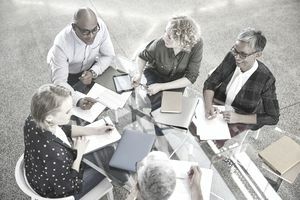 So, while you may talk about the sales “team” often what you have is a sales “community of practice.” The salespeople have similar learning needs: they need to learn to sell products. They have a community: salespeople have different functions and needs than manufacturers. They practice together: techniques that one salesperson develops can help another even if they aren’t on the same team. For example, you are in the business of operating a chain of grocery stores. Each store has a general manager, a produce manager, a dairy manager, and an HR manager. These people are a team: they all have the same goal of helping this store succeed. They want high sales, happy employees, and a good working environment. All of these managers support one another. However, the dairy manager and the HR manager don’t have a great deal in common. The HR manager doesn’t have the necessary skills to help the dairy manager with stock rotation problems, and the dairy manager isn’t the best person to help the HR manager handle disciplinary issues. What each of these managers needs is contact and support from their community of practice. So, the dairy manager at store A can call up the dairy manager at store B and ask for help. The HR managers at all stores get together on a quarterly basis to help one another develop best practices. Having this type of support can help each person bring back the best knowledge, skills, and abilities to their team. An HR manager who receives solid support from her community of practice is better equipped to help the store manager make good decisions. These communities of practice keep strong bonds across the organizations while strengthening the individual teams. You want to have teams that work together for a common goal, and provide support to each member across that team. Understanding and taking advantage of communities of practice can help every employee succeed in their own sphere. A community of practice provides the solid support that you need for success.